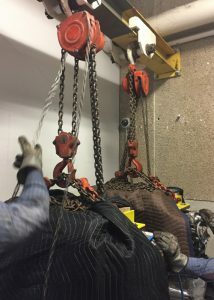 Project images from the many rigging and machinery moving projects we have worked on and are currently working on. 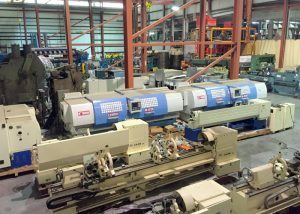 Please check back as we update our photo gallery regularly. 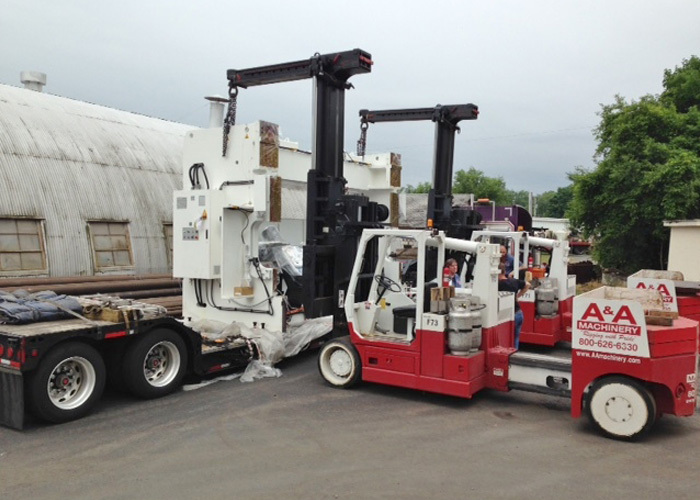 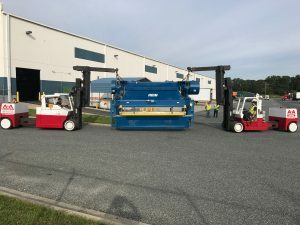 Offloading a new 300T press with two Versa-Lifts. 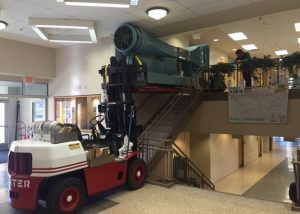 Operators are using the two Versa-Lifts remotely, working in tandem. 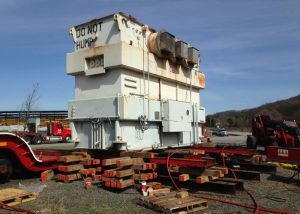 55,000 lb. 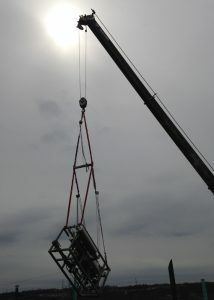 prefabricated concrete communication hut being placed in location by 60/80 Versa-Lift with hydraulic boom attachment. 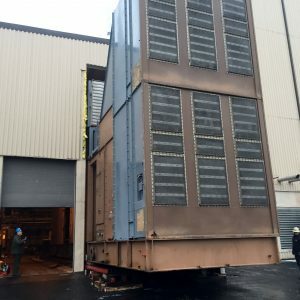 Two sets of gantry posts placing the G5 steam turbine condenser in storage prior to the system being sold at an auction. Rainy and muddy conditions couldn’t stop our crews placing in location a 60,000 lb. 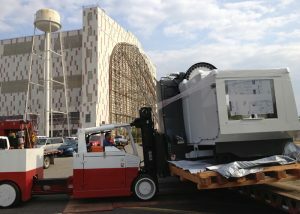 mobile MRI trailer. 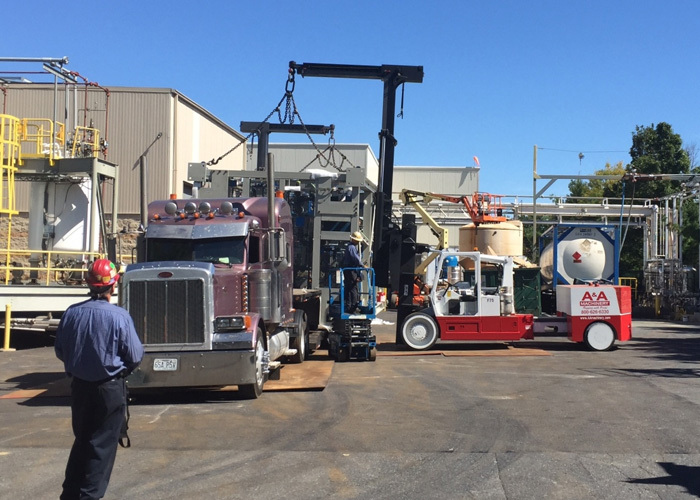 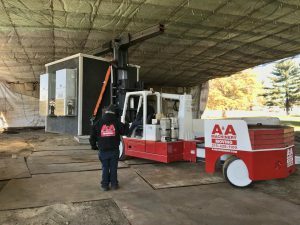 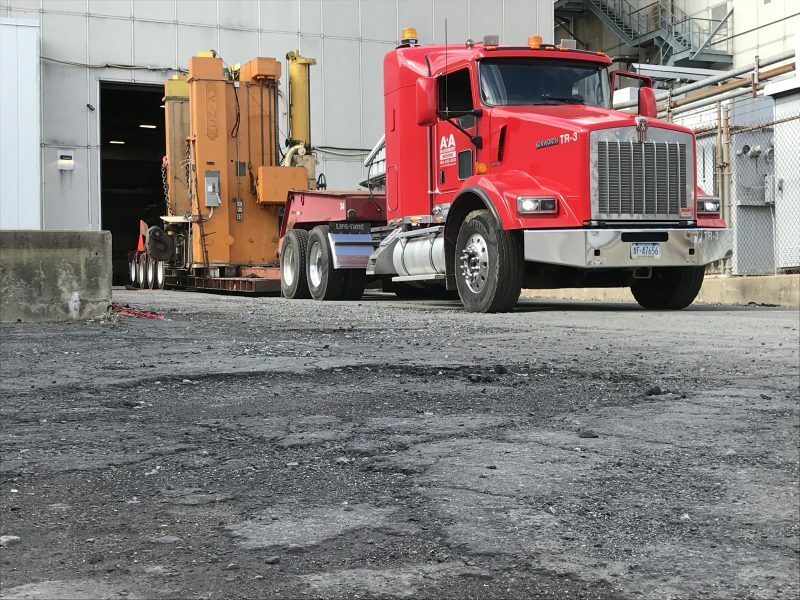 Our BPI rough terrain forklift was used to place the MRI trailer on concrete pads. 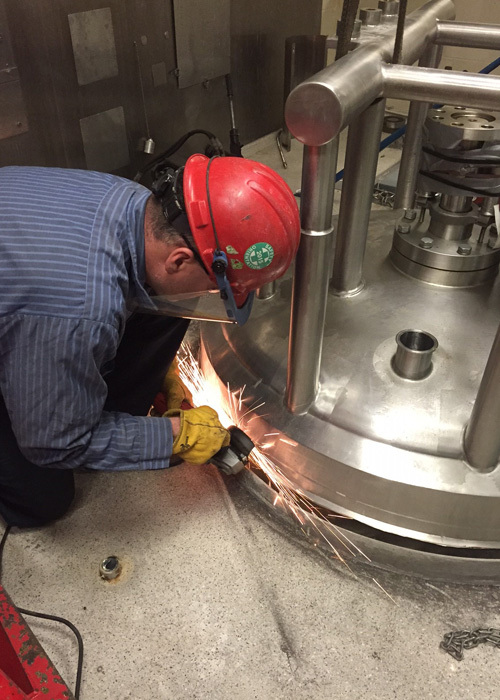 Removal process of 14 reactors from a nutritional product plant during a demolition project. 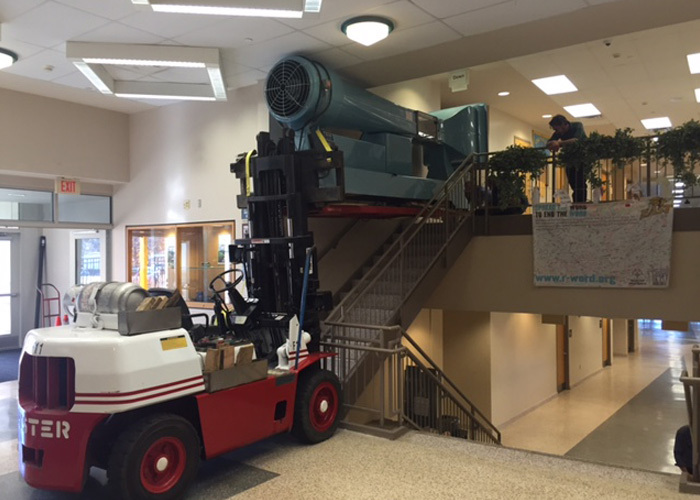 The “King” is leaving the building. Removing and hauling a 110,000 lb. King Turret press and installing in its new location. Relocating a HAAS at a local machining shop under the stars and bars. 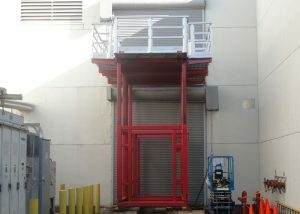 Our friends over at Hart Mechanical took this photo of the job. 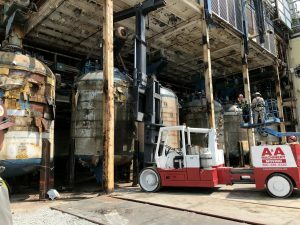 Our crew removing a G5 generator system from its location for relocation at a power plant using slider and unified hydraulic system. 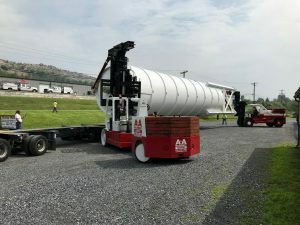 Providing some high-value hauling for a local University. 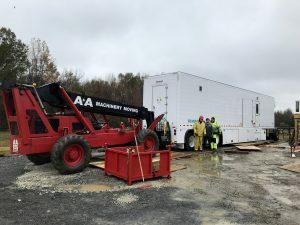 Our crew relocating an 18ft. 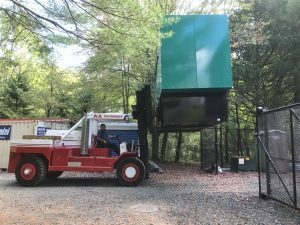 long, 11ft. high vessel from the physics lab. 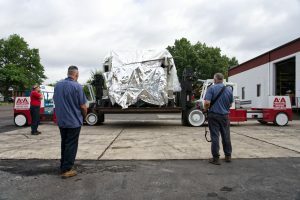 Declared value of the vessel was $5M. 4 1/2 MW solar generator removal. 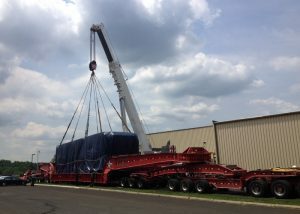 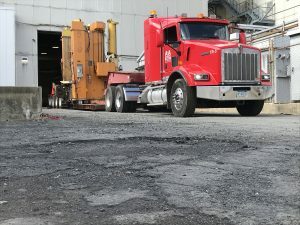 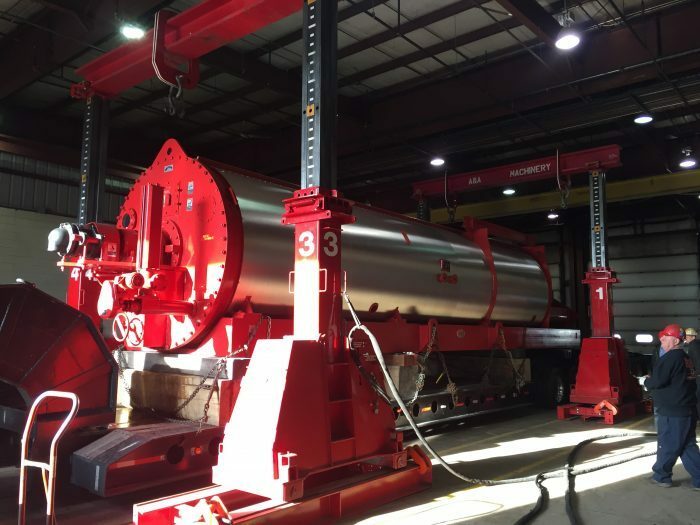 The generating portion of the unit weighed 25,000 lbs. 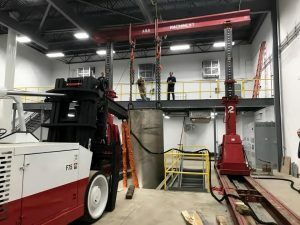 The unit was in confined spaces in the basement of a local college, which offered up some challenges. 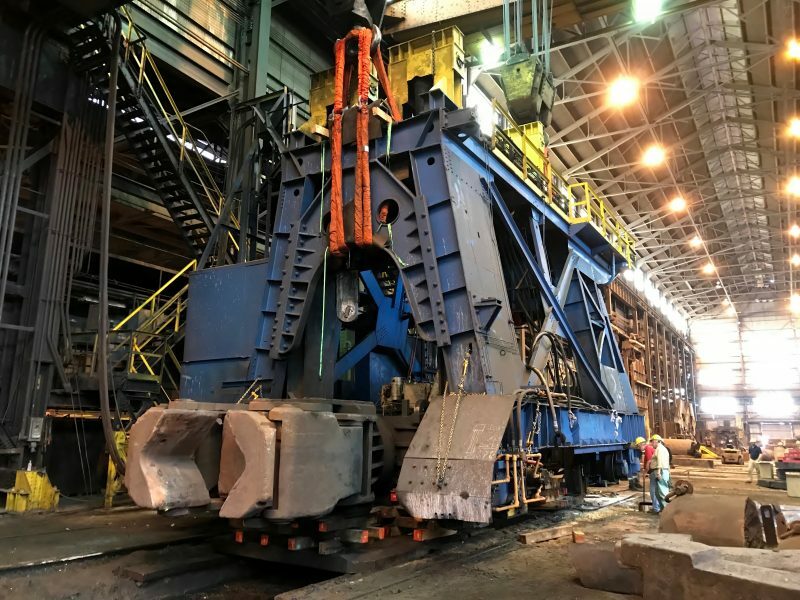 Disassembling the 150T Manipulator at heavy industrial forging operation. 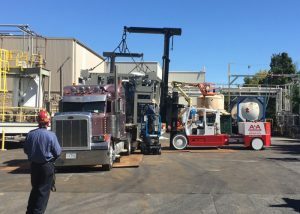 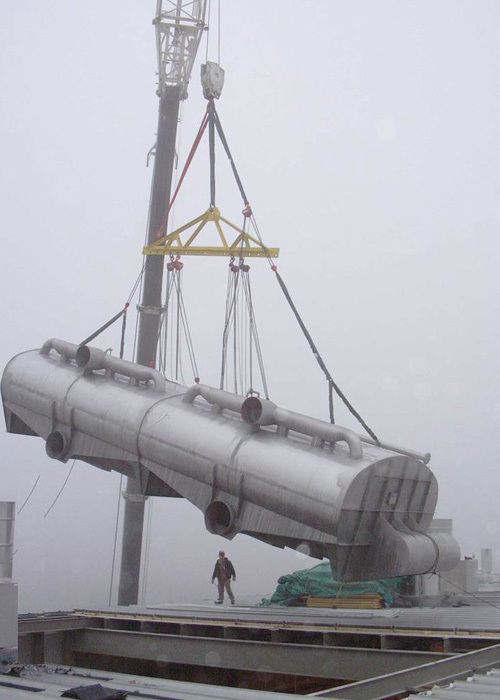 Tandem pick and removal of a 60 ft. liquifier, weighing 110,000 lb. 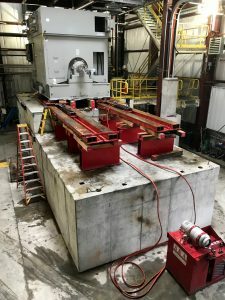 from a metal fab shop. 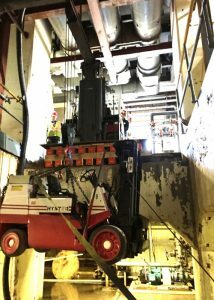 50T pressure vessel, lowered into a pit 12 ft. below the floor. 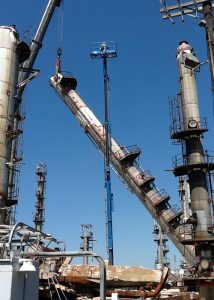 Using a 60/80 Versa-Lift and a pair of J&R gantry legs, our crew only had inches to spare. 25/35 Versa-Lift placing in location a Trumpf press at a local manufacturing plant. 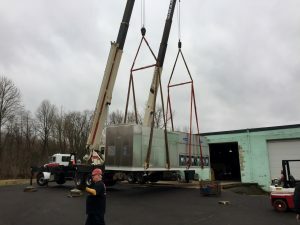 Relocating two (2) 13,000 lb. 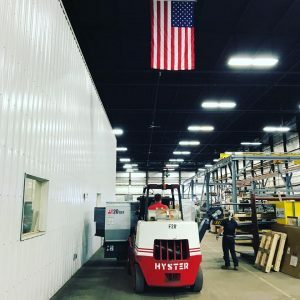 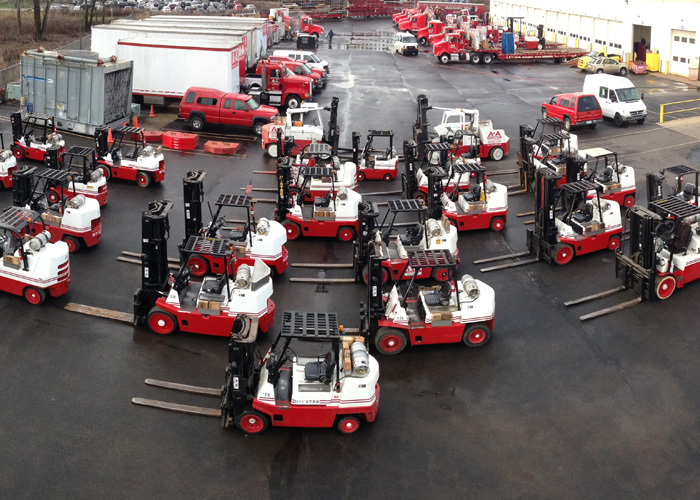 generators with our Taylor forklift. 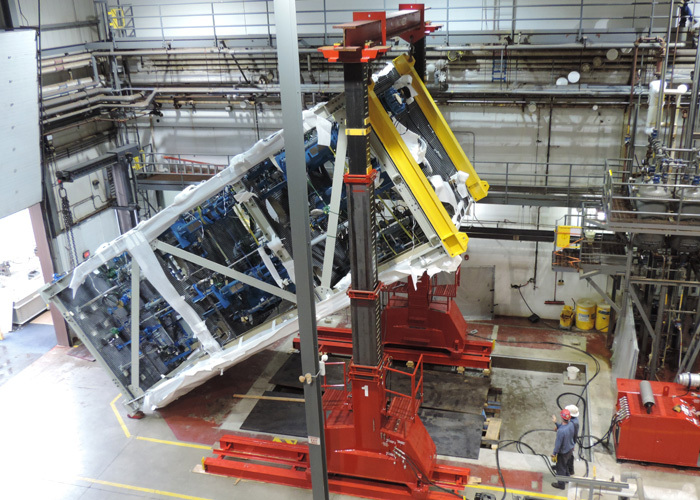 Assisting in the rigging and assembly of a Haver Roto-Packer. 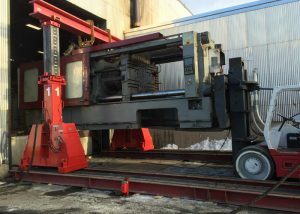 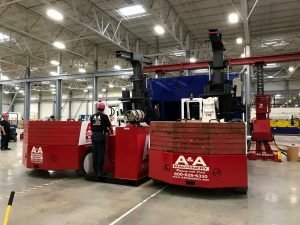 Tandem pick of a Heim stamping press with two (2) Versa-Lift forklifts. Remove, load, and deliver a 44,000 lb. 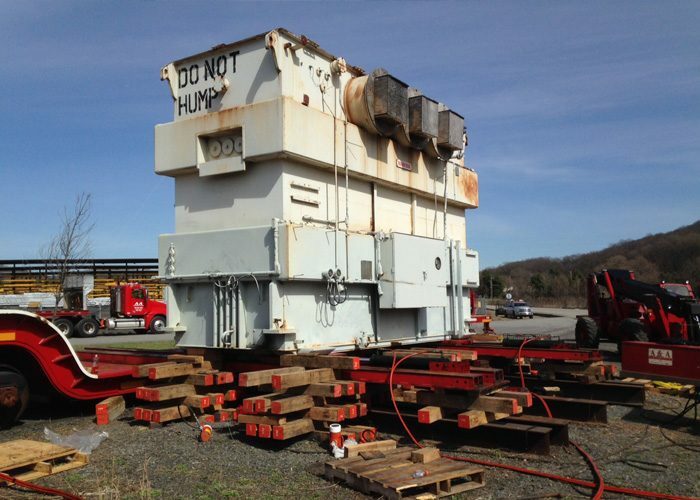 piece for in Levittown, PA. Removing a 35,000 lb. 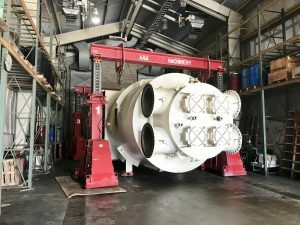 generator rotor from an enclosed crane bay area. 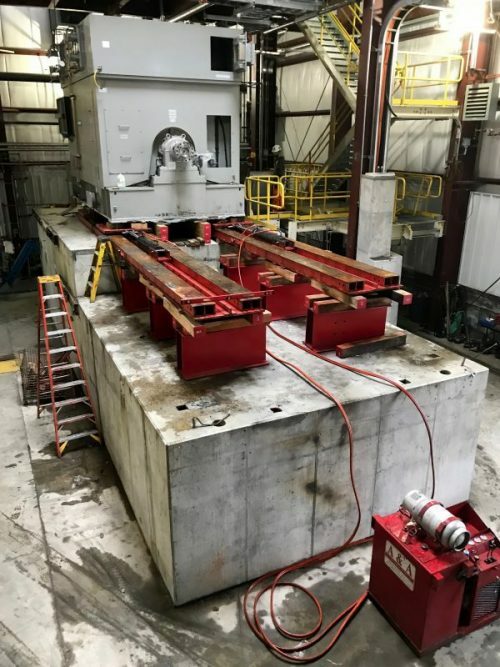 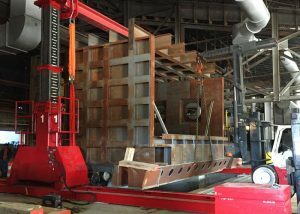 Laying over of a 632 Ton Schuler Hydraulic Press with the use of Versa-Lifts and a gantry system. 1,500,000 lbs of 5″ steel plate being taken a part from a Schuler Press. 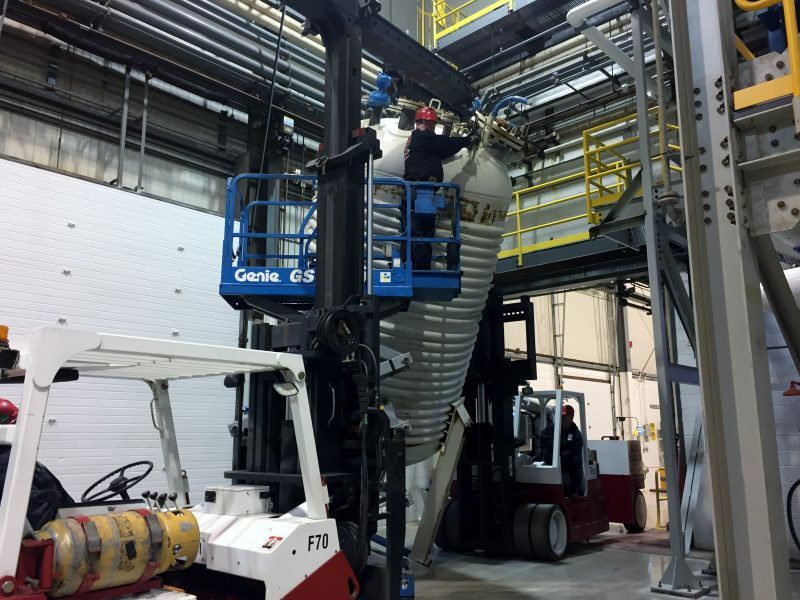 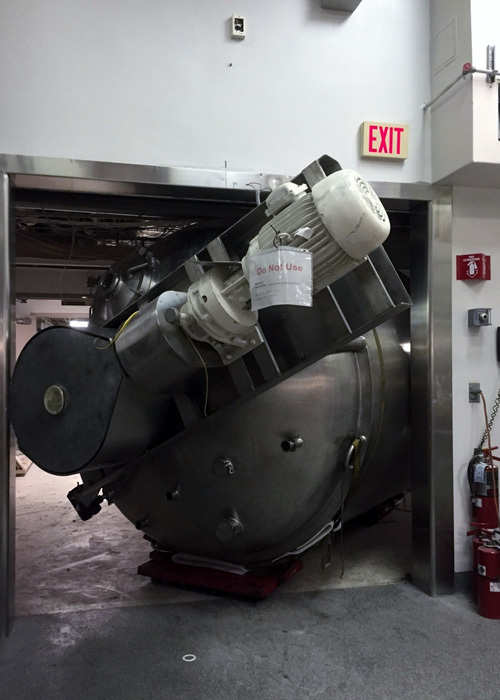 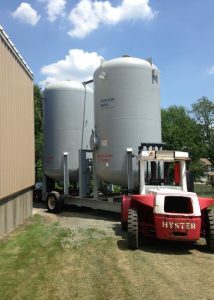 Moved the tank inside the facility using two Versa-Lifts and stood the tank up-right to prepare for installation. 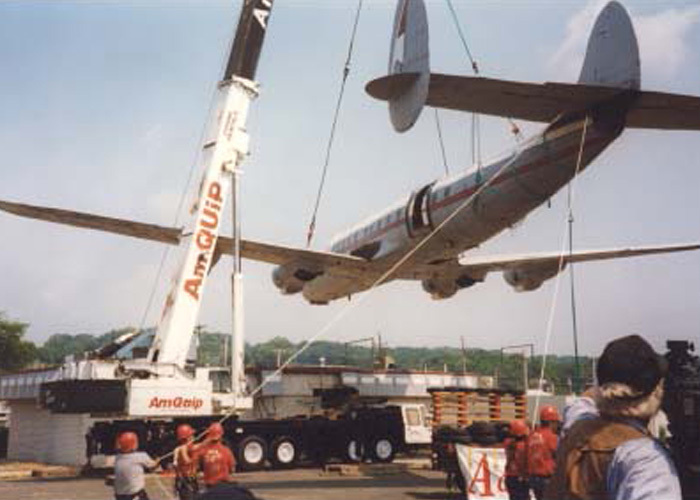 Rigging removing of a 350,000 lb. 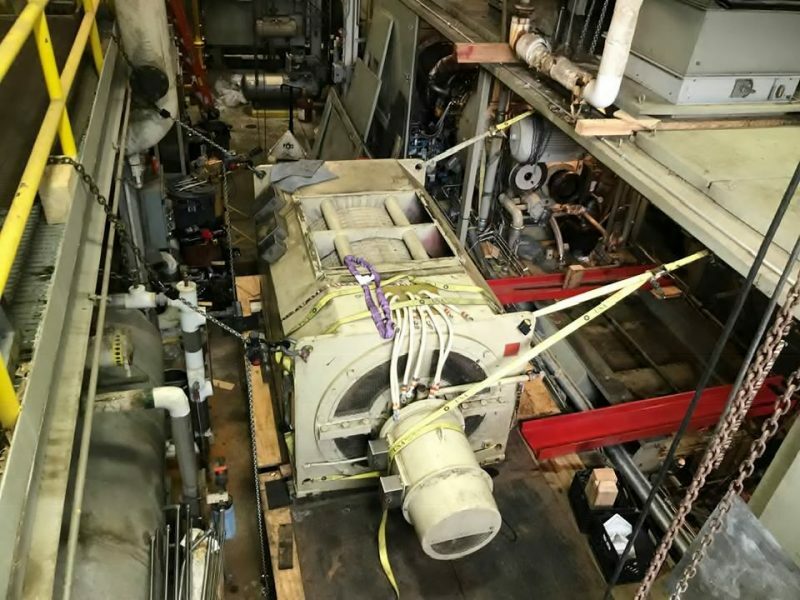 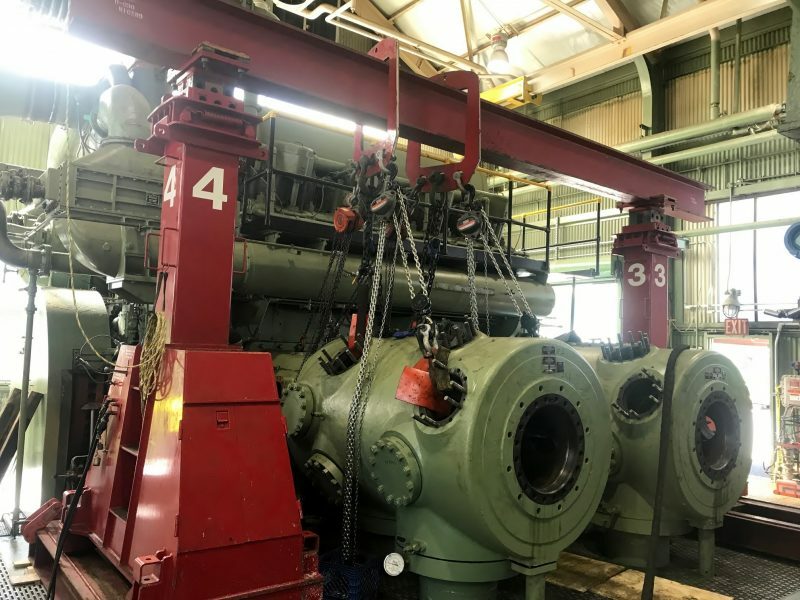 GE LM2500 gas turbine generator (GTG) using hydraulic sliders. Notice the small clearance between the unit and the building. 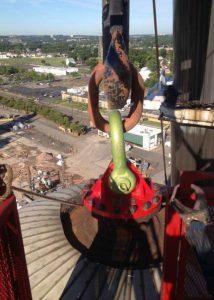 Rigging removing of a 350,000 lb. GE LM2500 gas turbine generator (GTG) using hydraulic sliders. 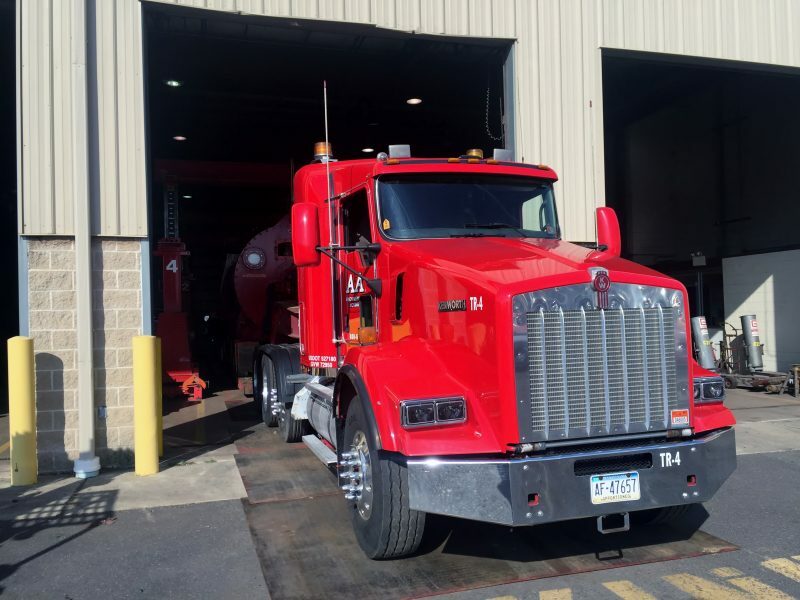 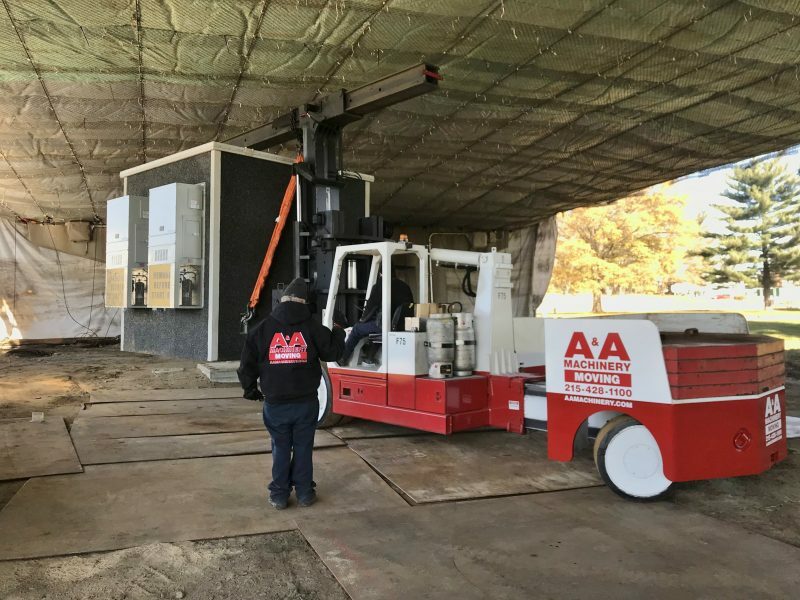 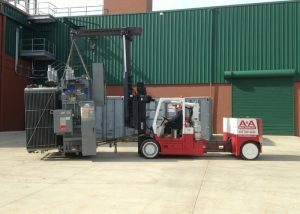 A&A truck being loaded at our shop. 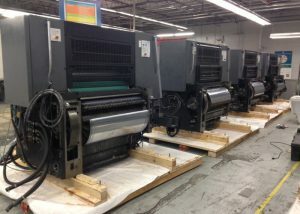 Printing press line in the staging process of being crated and packaged for international shipment. 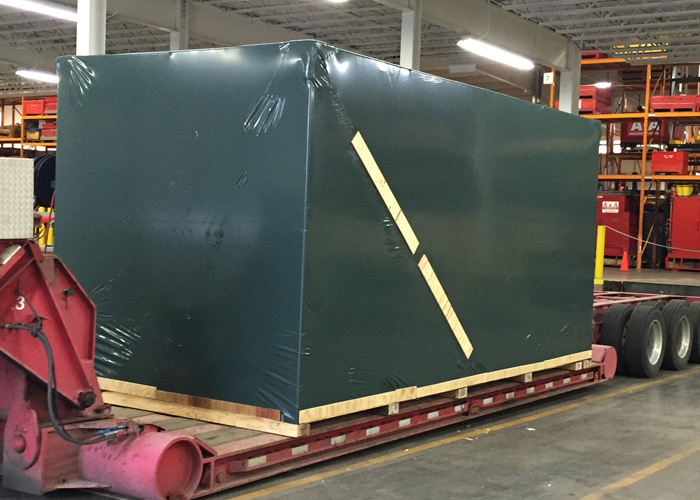 We built custom skids for each unit, secured units to the skids, double plastic wrapped, and loaded in a container. 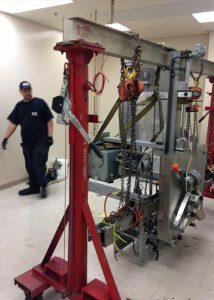 Gantry posts set in place to remove and stage a few gas compressor cylinders from a 8V-250 engine frame they were attached to. 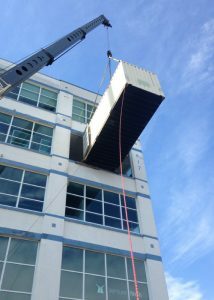 Removing the tanks from the building through a rear wall penetration with no access road. 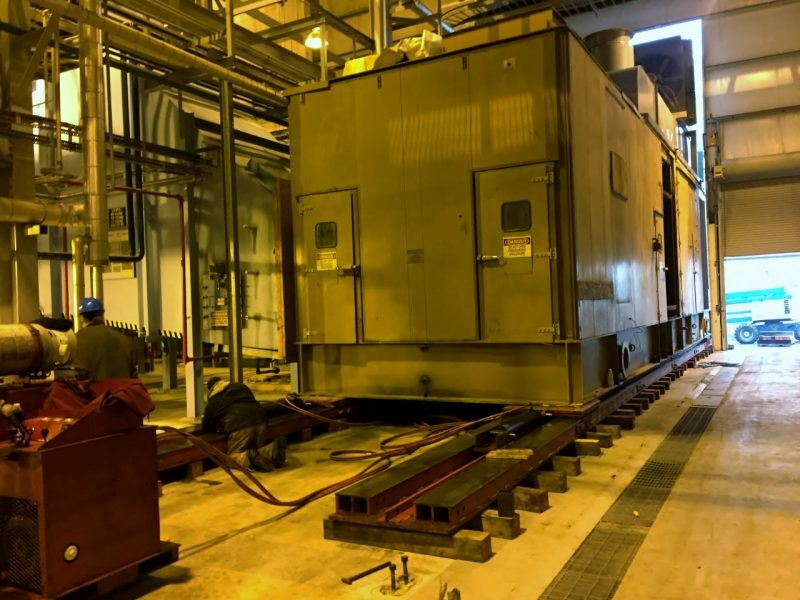 Steam Generation module rigged into Pharmaceutical plant through a roof opening shorter than the base dimension. 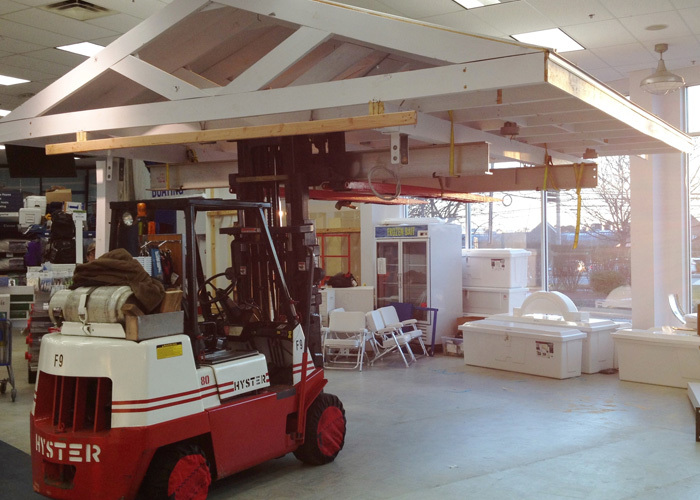 Unit was tilted to fit through opening and leveled with the attached hoists once under roof plane. 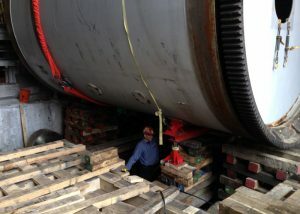 Removing one of seven (7), 40’ long 42,000 lb. 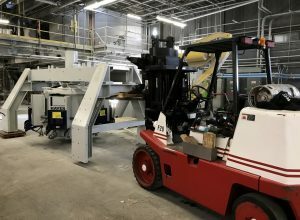 bakery oven sections from upper floor of bakery using two cranes. 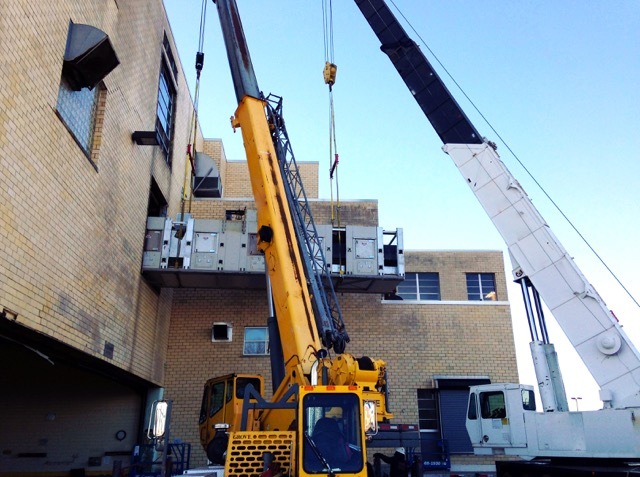 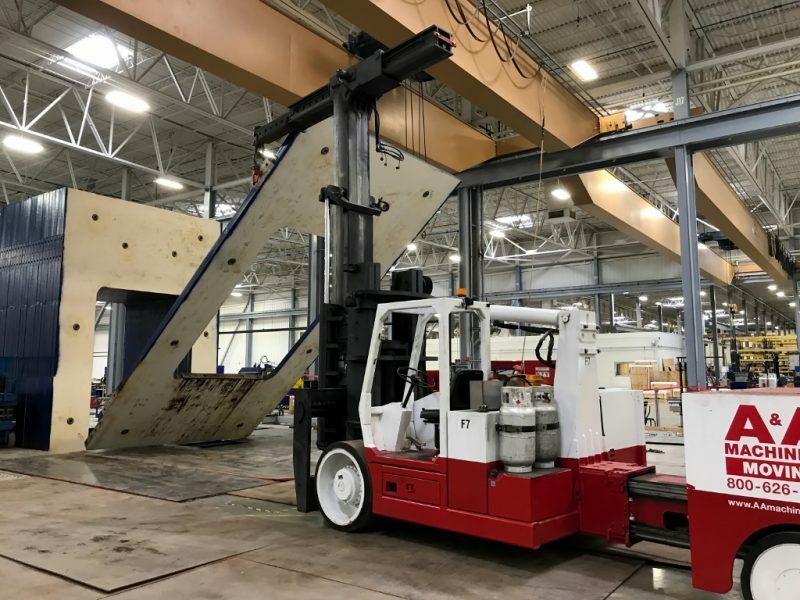 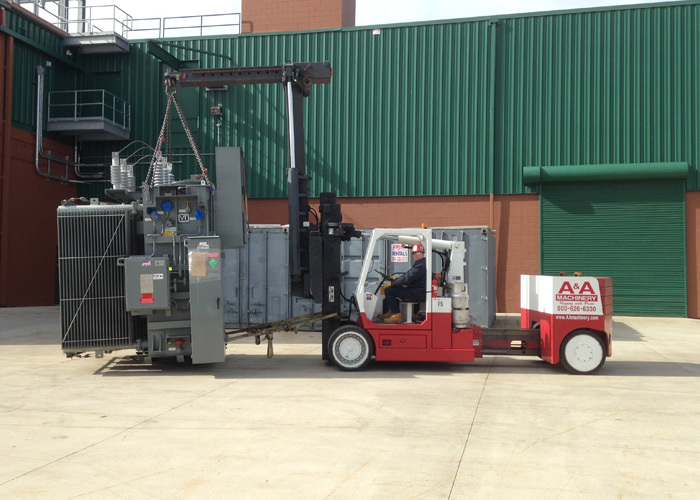 Using two (2) Versa-Lift™ 60/80 with remote operators to off-load 58,000 lb. distillation column modules from trucks. Operating Versa-Lift™ remotely enables accurate monitoring of load hoisting and clearances. Using 300 ton hydraulic gantry to assemble 550,000 lb. 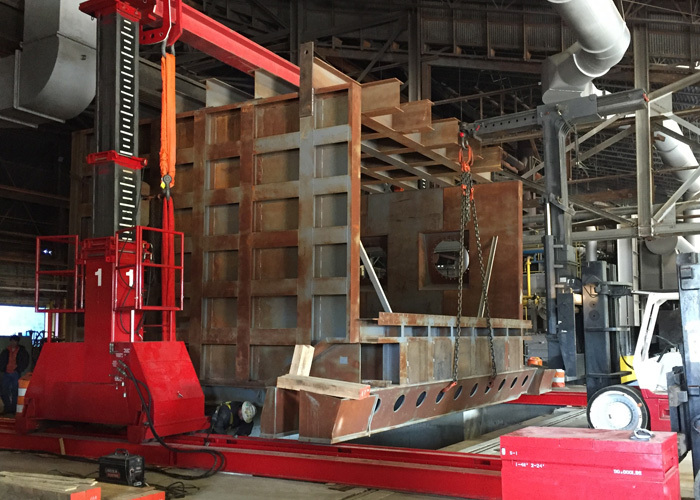 tilting aluminum melt furnace. It’s ‘wash day’. 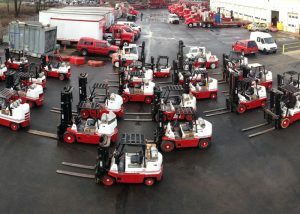 Some of our rolling stock lined up for routine washing and cleaning. 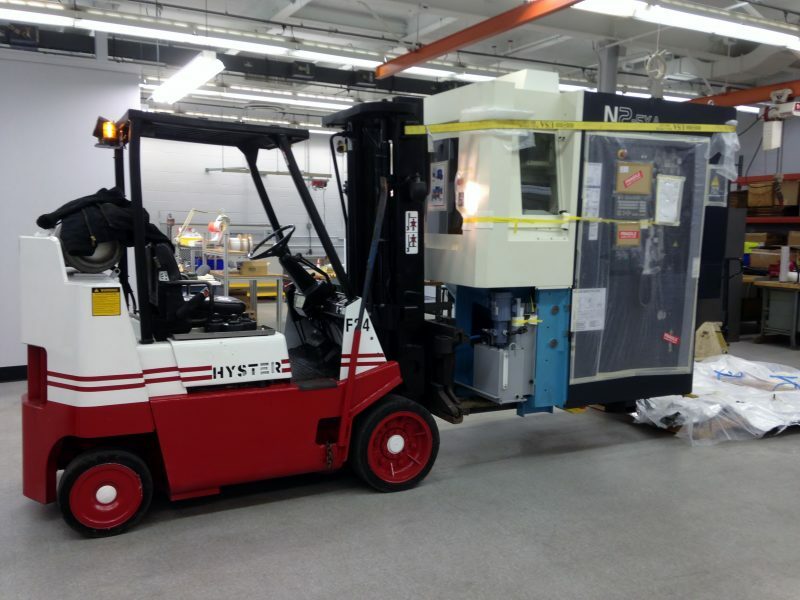 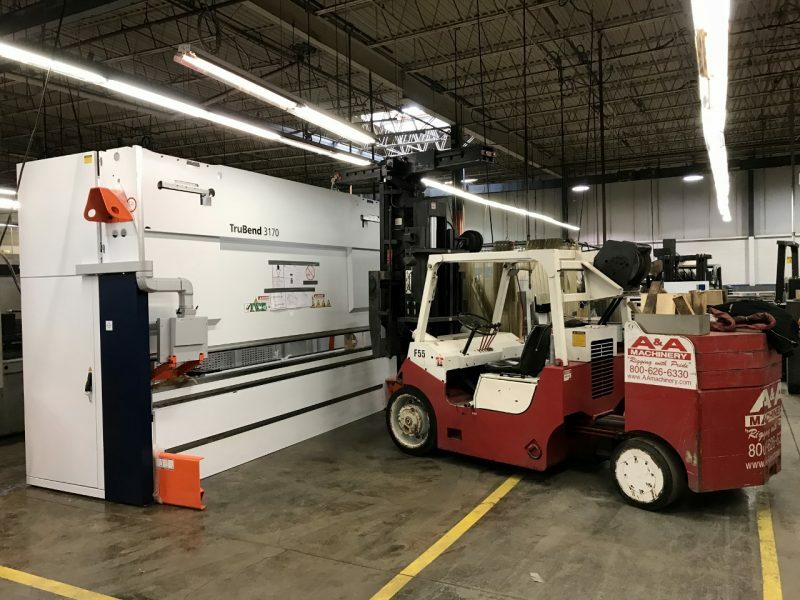 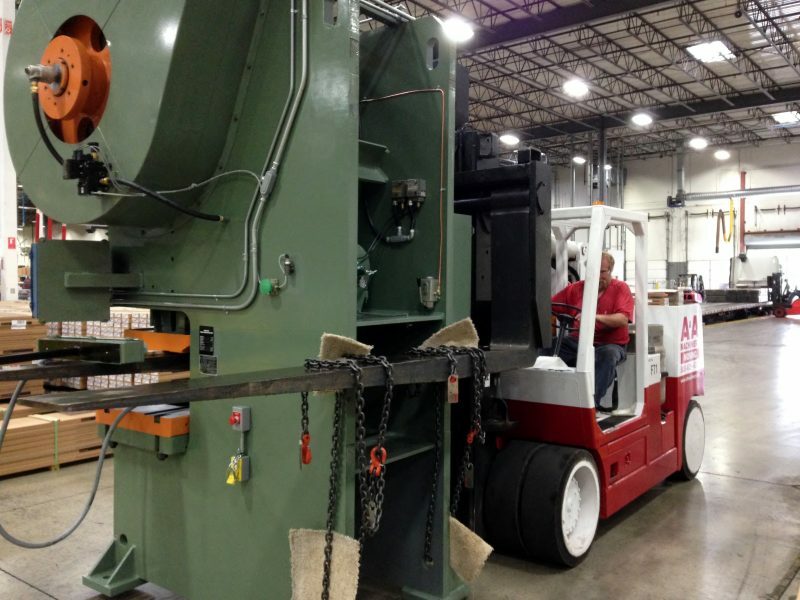 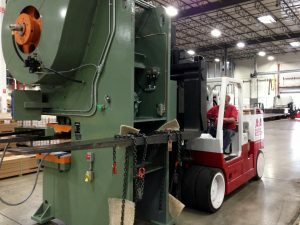 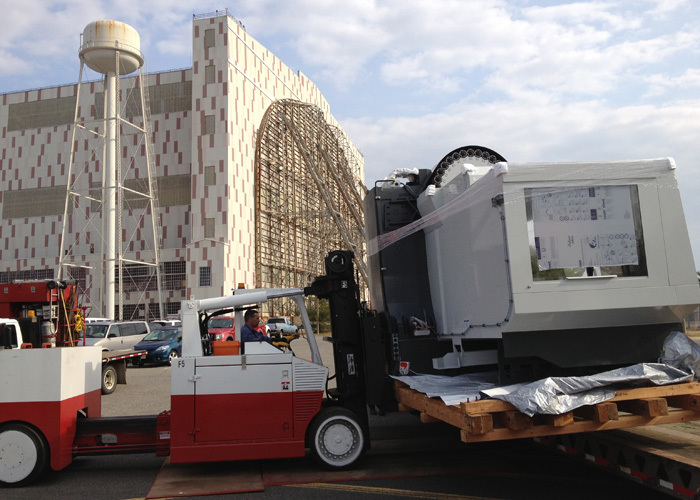 Using Versa-Lift™ 40/60 to unload Haas VF-10 large machining center for turnkey installation. 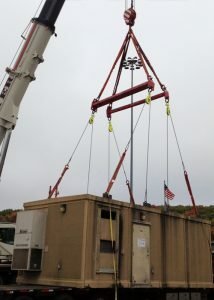 Scope included foundations, electrical and mechanical. 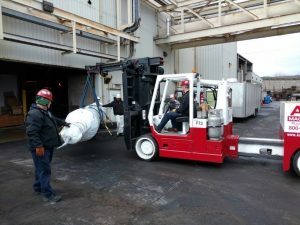 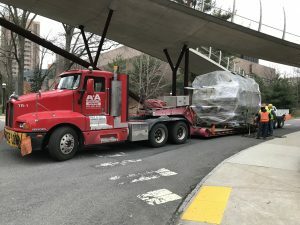 Removal and replacement of 200,000 lb. 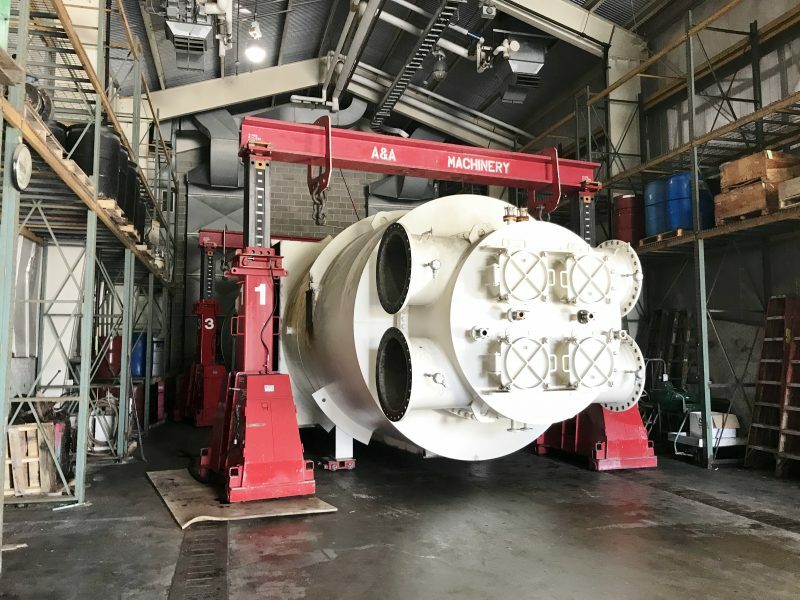 rotary kiln. 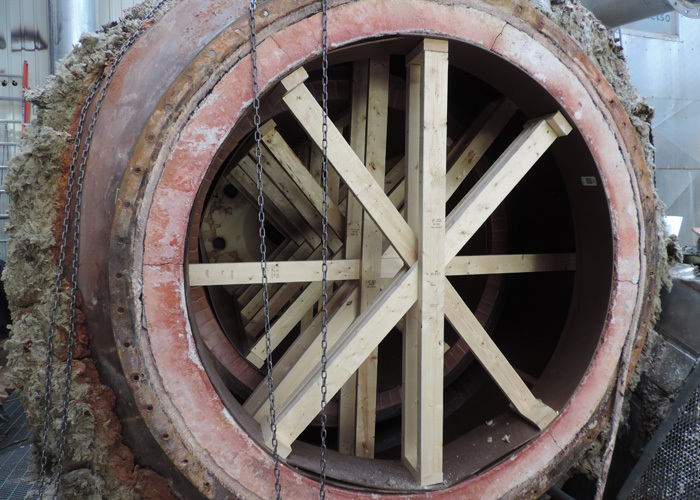 Required plating and cribbing of basement area to jack and slide kiln sideways to remove, and the same process in reverse to install the new rotary kiln. Small manual gantry used to relocate pharmaceutical equipment in plant areas with access limited to personnel doorways. 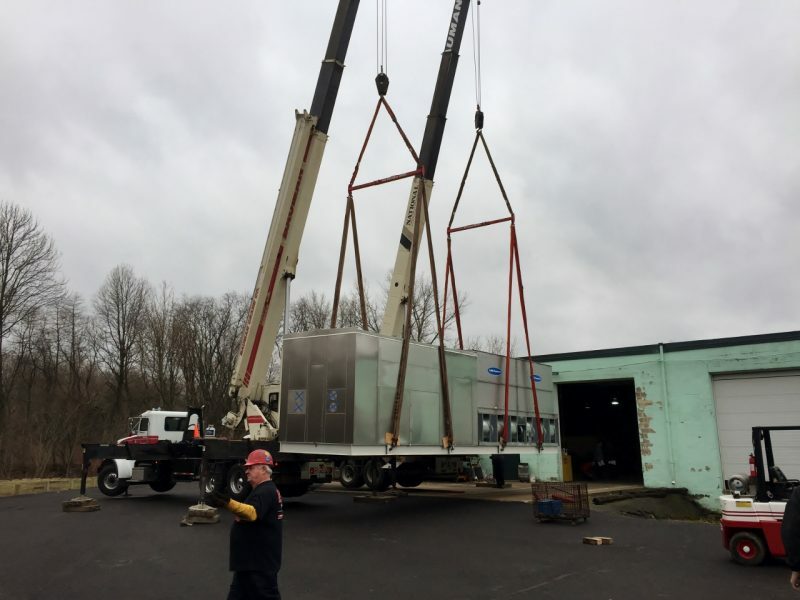 Relocating modular buildings for PA Turnpike Commission. Included loading, transport, unloading and placing in new location. Rigging contents of a container into the 4th floor of a building through a window penetration. 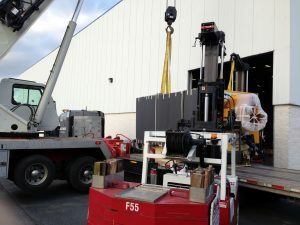 Unloading 660 ton capacity press brake frame with a pair of Versa-Lift 40/60’s. 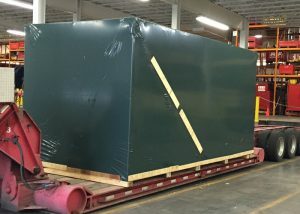 Machining center packaged for export including ISPM export stamp, shrink wrap, desiccants, shock monitors, etc. 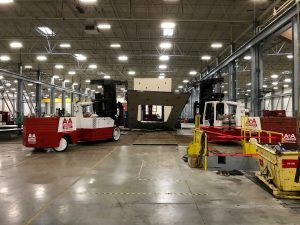 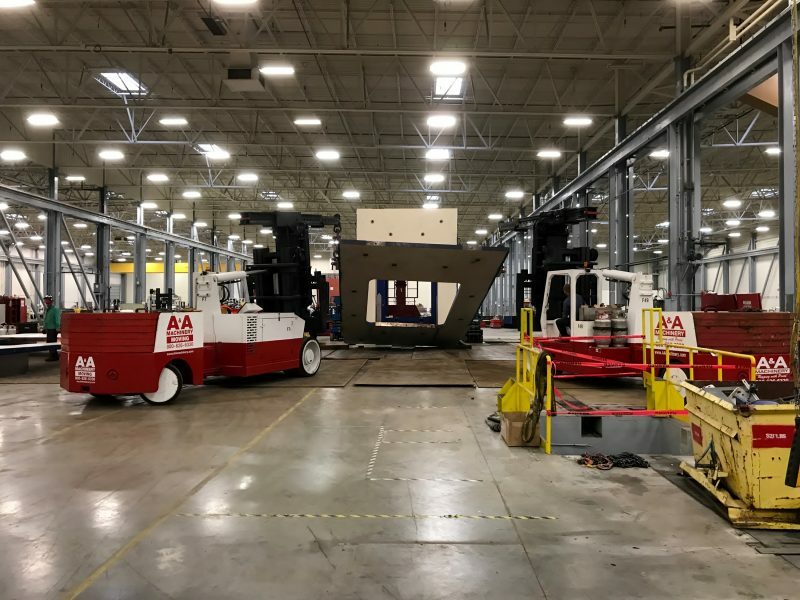 A&A designed 35,000 lb. 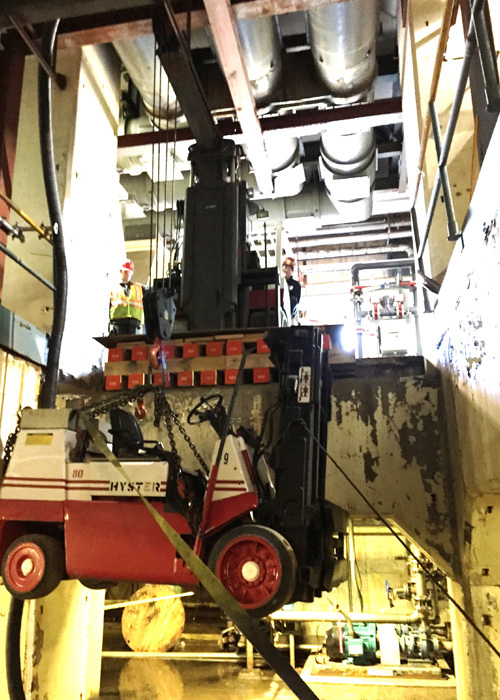 capacity adjustable work platform used to insert and extract equipment through upper floor penetrations. An example of using engineered controls to accomplish work safely and efficiently. 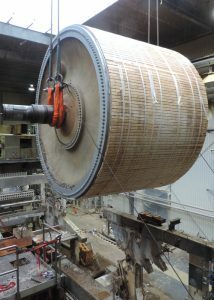 Removing 156,000 lb., 18’ diameter x 25’ long Yankee Dryer from tissue mill in Lincoln, ME for reinstallation in Canada. 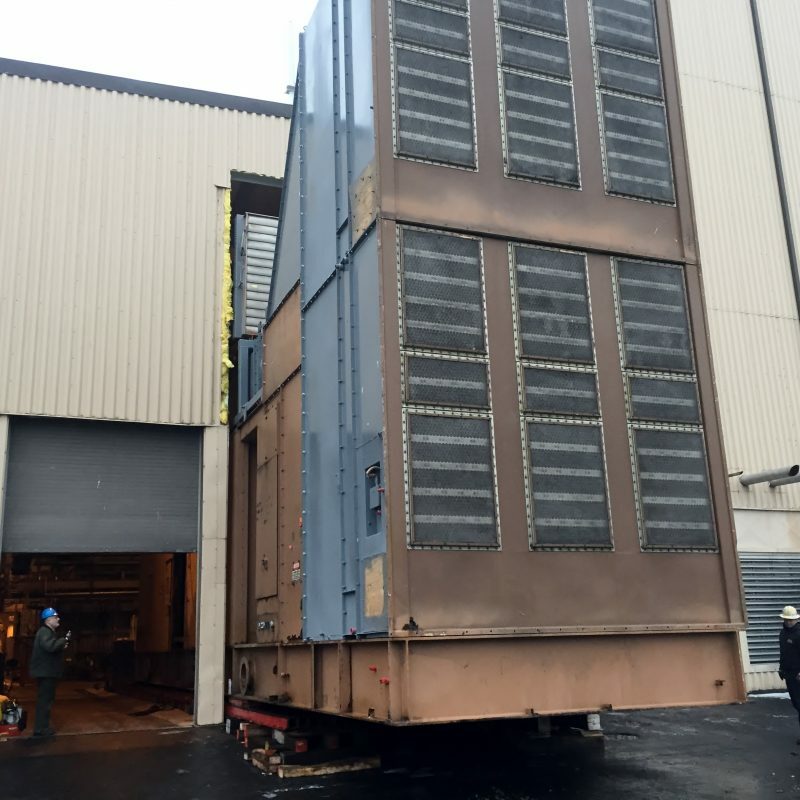 Dryer was wrapped in felt and then clad for protection prior to removal. Internal bracing and support of refractory in burner units for removal and transport. 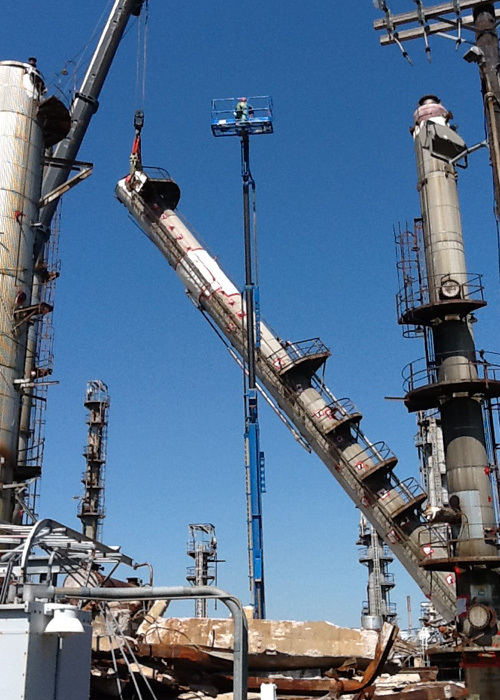 Erecting a pharmaceutical distillation column module within near-zero clearance environment using 300 ton hydraulic gantry system. 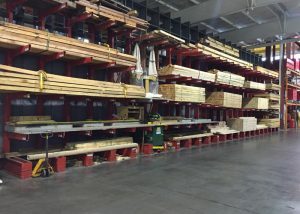 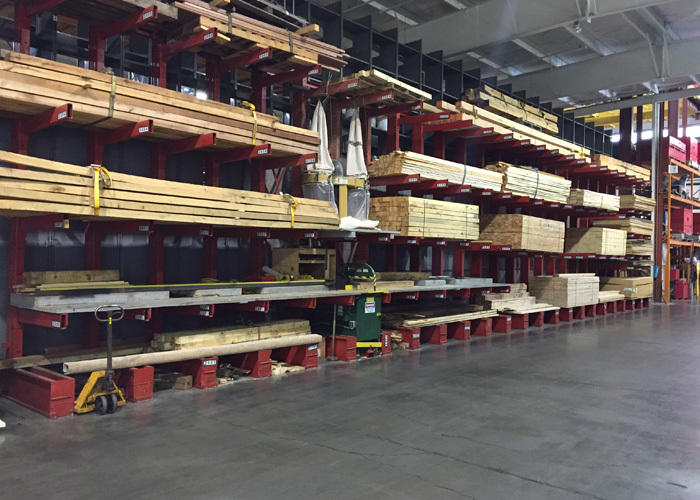 170,000 square-foot of warehousing and storage with 7 overhead cranes with lift capacity ranging from 10 ton to 70 ton. 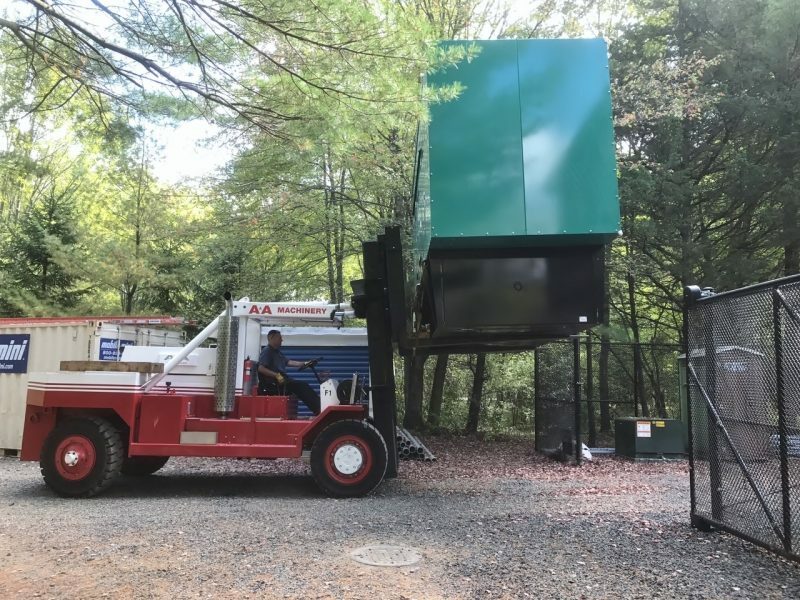 Moving a electrical transformer with a Versa-Lift 40/60.